Fortnite has exploded since the beginning of 2018. With the release of Fortnite Mobile for Apple devices people have more access to the game making it even more mainstream. Today we are talking about one of the most controversial cities on the Fortnite Map known as Tilted Towers. At the beginning of April, Epic Games put a small light in the sky that was not distinguishable from the rest of the stars in the sky, but a couple weeks ago people noticed it and realized it was getting closer to the map day by day. 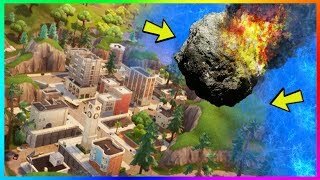 I am going to talk about what might go in the place of Tilted Towers after the comet strikes. Tilted Towers is a hot spot right now, but Epic Games has been trying to find a way to get rid of it. Since this season of the battle pass is space themed they saw a opportunity to throw a giant rock at it. Many hints such as telescopes were added to the map, and recently on the roof of one of the buildings in Tilted, couch’s and signs have been added depicting Tilted Towers and meteors. There are many theories going around right now. Some say it won’t be changed, some think it will be nothing, but I have a few theories here. Rusty Ruins, this theory developed here at Friends (credit to Jared Miller). Rusty Ruins would be the ground zero of the comet and would have lots of metal and brick. It would have old buildings that are broken down and maybe chucks of rock from the comet. This theory I think is very likely and it would be similar to the small town of broken down houses between Anarchy Acres and Pleasant Park. Crazy Crater, this was created here at Friends as well (credit to Riley Roche). Crazy Crater would be scarce of homes and places to go. I think it would a small town with some shops. I think it may have a small mountain in the middle of a giant crater. I think this is possible, but not very likely. I think this area might be to desolate at that point. Retro Runways, this is one that I thought up. It is a small airport that is old fashion maybe with some broken down planes. I don’t think this is very likely. Mega Metropolis, this has circulated on the internet that Tilted Towers will be replaced with a bigger city. This city would have taller skyscrapers and a larger portion of the map. I think this is very unlikely. Most people do not want a bigger city that disrupts even more gameplay. To conclude, I think that Tilted Towers will change, but I don’t know in what way it will be different. Let me know some of your thoughts. Thank you, and have a great day.